His Honour Howard William Foote was born in Lamaline, Newfoundland and Labrador, and grew up in St. Lawrence and Fortune. Following high school at Fortune Collegiate, His Honour graduated from Burin Vocational School and completed the apprenticeship program at the College of Trades and Technology in St. John’s obtaining a Journeyman Electrician License. His Honour worked as a Journeyman Electrician for 25 years throughout Canada and the United States. In 1999, His Honour began working with the Cahill Group of Companies as General Manager in the areas of human resources and labour relations. He retired in December, 2017. 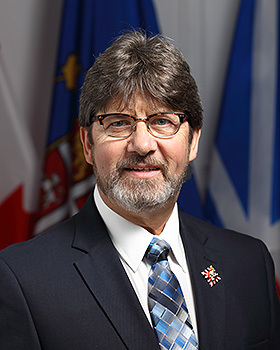 His Honour continues to contribute to his community and has volunteered with Scouts Canada, Royal Canadian Sea Cadets, and minor hockey in Newfoundland and Labrador. His Honour and Her Honour Judy May Foote, Lieutenant Governor of Newfoundland and Labrador, have three children and four grandchildren.